I received an email about Tiny Wastelands kickstarter recently. I've really enjoyed Tiny Epic Kingdoms and Tiny Epic Galaxies. A post-apocalyptic game sounded awesome. When I checked out the kickstarter, I realized it was a "Tiny" game not a "Tiny Epic" game. I could have just stopped there but I decided to learn more about the Tiny games from Gallant Knight Games. I learned of the TinyArcade when it was launched on kickstarter. It looked interesting but not enough to convince me to back it. Since playing with the TinyScreen Video Game Kit, I debated picking up the TinyArcade. To my surprise, TinyCircuits played my viobyte game and liked it. They offered to send me a TinyArcade if I would port it to that platform. Valentine's day is for showing your love to others. Everyone runs out and buys cards to hand out. I don't particularly like buying cards. The cards are very expensive for paper that you just toss later. I sometimes find the cards to be a little generic as well. 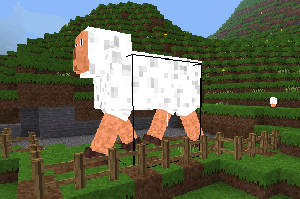 My youngest searched for a mod for Minetest to add the Thing from the Fantastic Four. Needless to say no one had created such a mod. I thought about it and figured I might be able to solve the problem. A simple mistake led me to discover how to shrink a monster. Some time ago, I had a Space Invaders keychain which played a monochrome version of the game that was fun. When it broke I purchased a color version of the keychain. It also broke. My youngest thought I should get another one. Last I looked I didn't find anything I liked but I tried again. My search discovered the TinyScreen Video Game Kit. A college friend visited over the summer. I volunteered to run a 5th edition Dungeons and Dragons game for him and the kids. For my 4th edition games, I typically create an original adventure but borrow encounters from various adventures. I planned on doing the same for 5th edition. The storyline was going to involved a telepathic chicken and a crazy druid. But when I searched for adventures to steal from, I discovered a Boy and his Modron. 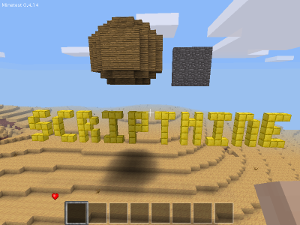 My son recently attended a "Coding with Minecraft" at the library. The class didn't explain too much about programming. It was more about exposing them to the idea of what could be done. The class showed them how to run functions to build things. Amarillo Design Bureau released the Prime Directive PD20 Modern Supplement as an early bird PDF edition. I have never played the Star Fleet Battles games nor even Prime Directive. My purchase of Prime Directive was to get a D20 Modern Star Trek game. D20 Modern was not a great system but I enjoyed the familiarity of the system. The official religion of the Mirtish Empire set by the first Emperor Eratos. According to the Emperor, he turned to Attun when the god revealed himself in a dream and demanded the false idols be forgotten. Some believe the change was simply political due to the interference of Gracos high priests. By starting a new religion with him at the top, the Emperor could not be questioned. Goblinoid Games recently released Apes Victorious. As a fan of the Planet of the Apes, it immediately caught my interest. In the past I'd flipped through Terra Primate but didn't want a new system for something I probably wouldn't use. Apes Victorious listed conversion notes for Labryinth Lord, Mutant Future and Starships & Spacemen in the description. Thankfully Goblinoid Games released an artless version for people to try for free.